This is the first edition of Andreas for 55 years, also the first to present the Anglo-Saxon, or rather Old English, text with a parallel Modern English poetic translation. The book aims not only to provide both students and scholars with an up-to-date text and introduction and notes, but also to reconfirm the canonical merit of Andreas as one of the longest and most important works in Old English literature. The introduction to our text is substantial, re-positioning this poem in respect of nearly six decades’ progress in the palaeography, sources and analogues, language, metrics, literary criticism and archaeology of Andreas. The book argues that the poet was Mercian, that he was making ironic reference to Beowulf and that his story of St Andrew converting pagan Mermedonian cannibals was coloured by King Alfred’s wars against the Danes (871-9, 885-6, 892-6). Andreas is here dated to Alfred’s later reign with such analysis of contexts in history and ideology that the author’s name is also hypothesized. The Old English text and Modern English translation of Andreas are presented in a split-page format, allowing students at whatever level of familiarity with the Anglo-Saxon vernacular to gain a direct access to the poem in close to its original form. 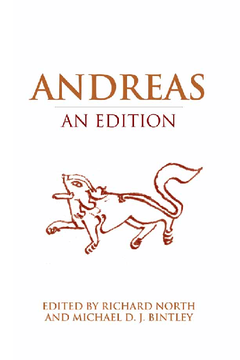 The translation follows the poem’s word order and style, allowing modern readers to feel the imagination, ideology and humour of Andreas as closely as possible. The text of the Old English poem is accompanied by a full set of supporting notes, and a glossary representing the translation. Professor Richard North teaches at University College London. His previous publications include The Origins of ‘Beowulf’: From Vergil to Wiglaf (Oxford University Press, 2006). Michael Bintley is Senior Lecturer in Medieval Literature at Canterbury Christ Church University and the co-editor of Trees and Timber in the Anglo Saxon World (Oxford University Press, 2013).